The seven sailors, including two from San Diego County, killed in a collision between a destroyer and container ship off Japan were in sleeping berths directly in the path of onrushing water, according to a Navy report released Thursday. The report outlined the findings of one of several investigations underway into the June 17 collision, in which the USS Fitzgerald was struck on its starboard side by the Philippines-flagged ACX Crystal in the middle of the night. 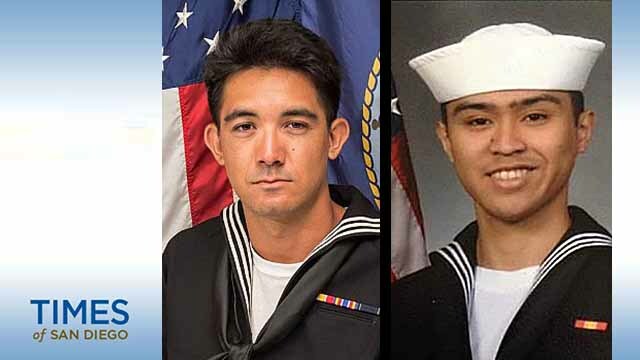 Then-Yeoman 3rd Class Shingo Alexander Douglass, 25, from San Diego, and then-Fire Controlman 2nd Class Carlos Victor Ganzon Sibayan, 23, from Chula Vista, were among those killed. The duo, and the five other victims, were posthumously promoted on Wednesday. The report focuses on the immediate aftermath of the collision and paints a harrowing account of the conditions faced by 35 sailors who had been asleep at the time. “The occupants of Berthing 2 described a rapidly flooding space, estimating later that the space was nearly flooded within a span of 30 to 60 seconds,” according to the 41-page report, which estimated the sailors had no more than 90 seconds to escape. The ladder by which the sailors escaped was on the port side, and water quickly climbed to their necks. The seven who didn’t survive were in starboard racks, and the only one who escaped by taking a route on that side went unconscious for a time and wasn’t sure how he got out. Navy officials who wrote the report praised the heroism of the sailors in the damaged portion of the ship for helping their crewmates. At least two lives were saved by sailors who stayed in the area to provide assistance, the report noted. The Fitzgerald’s combat information center and commanding officer’s quarters, which were above the waterline, were also heavily damaged by the container ship’s bow. A combat systems officer and his roommate were injured, and the commanding officer, Cmdr. Bryce Benson, was also injured and needed to be rescued. The Navy on Thursday announced plans to relieve Benson, his executive officer and master chief for mistakes that led to the deadly collision.